The world is laser-focused on the stock market with its recent volatility. That’s a shame. Because what the market does over a week, a month or a year, is utterly irrelevant to your financial life. Don’t take your eye off what really matters. At Old Peak, we have over 100 clients. So, we have plenty of experience creating and updating financial plans. I can tell you with confidence that short-term market movements have no impact on our clients’ ability to afford their financial goals. As long as you have a financial cushion of bonds, cash or predictable income — and all our clients do — you can ignore the market. How much you save, every year, until you retire. How much you spend, every year. That includes regular spending, big-ticket items like college for your kids and expectations around assisted living or nursing care. How you invest — primarily, how much you have in stocks vs bonds or cash, and what fees you pay. The stock market’s short-term gyrations simply do not factor in. Sure, if the market were to have a 20-year stretch of low returns, it would have an impact. When you create a financial plan, assume below-average long-term returns, to add a cushion to your plan. We do. There is one way a market drop can certainly hurt your financial plan. It’s indirect, but dangerous. If you bail out of the stock market after a fall and put all your money into “safe” investments — cash, short-term bonds or expensive products like variable annuities promising downside protection — you lock in low returns. That will force you to spend less throughout your life. The lesson: ignore the stock market, which you can’t control. Long-term, it will almost surely produce attractive returns. Focus instead on what you can control. 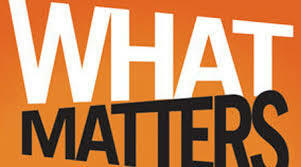 That’s what really matters.